Friday, February 15 with Orquesta La Moderna Tradición at the Freight and Salvage, Berkeley, CA. Cuban charanga music with my old pals – I played with them for 16 years and recorded three albums. Music starts at 8:00 pm. Saturday, February 23 with Ray Obiedo & Friends at the 7 Mile House, Brisbane, CA. With Ray Obiedo – guitar, Leah Tysse – voice, David Belove – bass, Melecio Magdaluyo – saxophone, and Colin Douglas – drums. 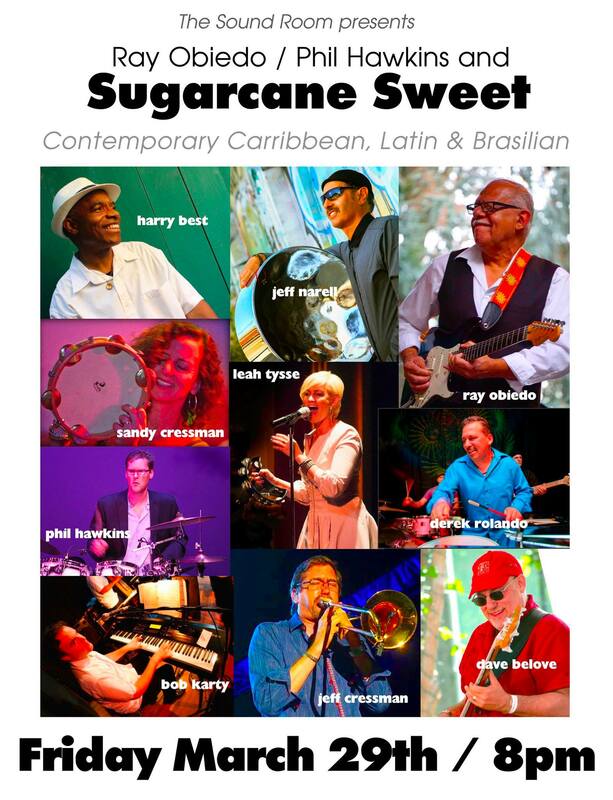 Friday, March 29 – with Ray Obiedo & Phil Hawkins’ Sugarcane Sweet at The Sound Room, Oakland, CA. Caribbean music and Latin jazz with the Bay Area’s finest. Featuring singer Harry Best, with Ray Obiedo – guitar; Phil Hawkins – drums; David Belove -bass; Jeff Cressman – trombone; Jeff Narell – steel drums; Derek Rolando – percussion; and Sandy Cressman & Leah Tysse – background vocals. 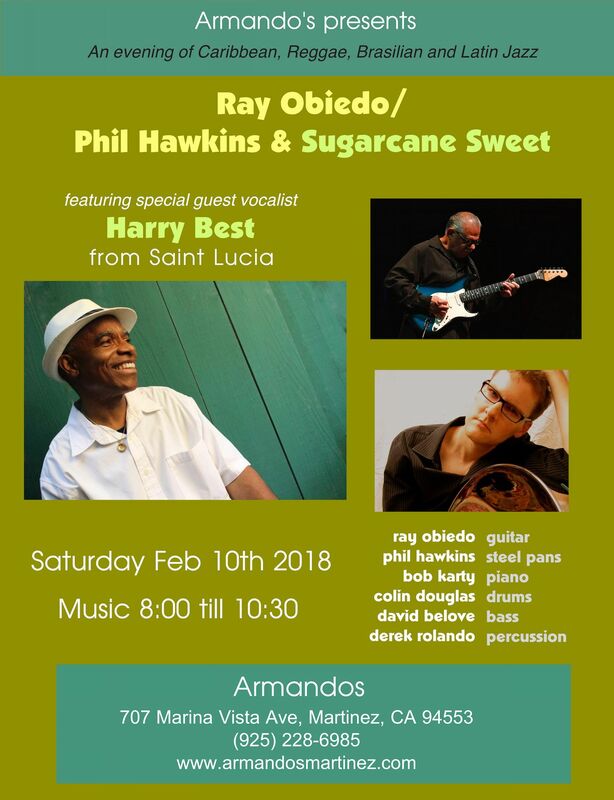 Saturday, February 10 – with Ray Obiedo and Phil Hawkins at Armando’s, Martinez, CA. Caribbean, Brazilian and Latin jazz mixed with East Bay funk, featuring Ray Obiedo – guitar, Harry Best – vocals, Phil Hawkins – steel drums, David Belove – bass, Colin Douglas – drums, and Derek Rolando – percussion. 8:00 pm. 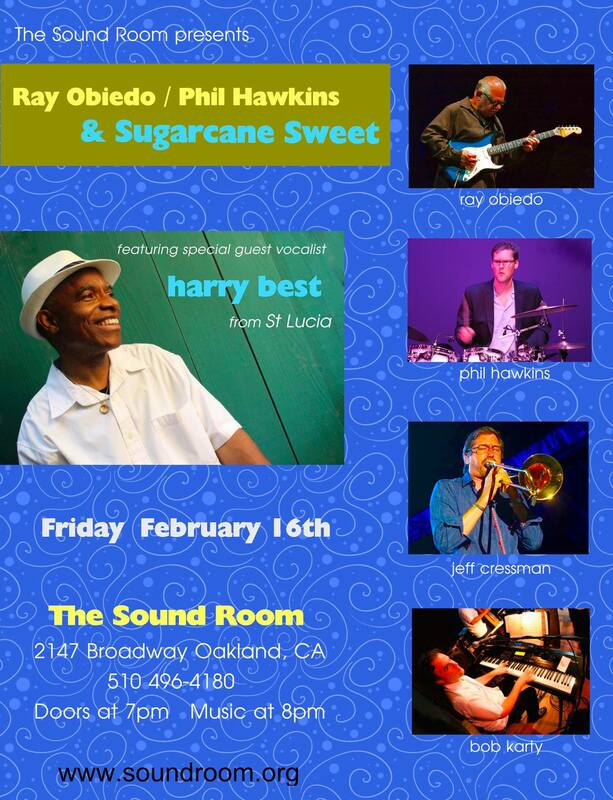 Friday, February 16 – with The Ray Obiedo Group at The Sound Room, Oakland, CA. Brazilian and Latin jazz mixed with East Bay funk, featuring Ray Obiedo – guitar, Jeff Cressman – trombone, David Belove – bass, Phil Hawkins – drums, and Derek Rolando – percussion. 8:00 pm. Saturday, April 28 – with Ray Obiedo for the John Muir Land Trust “Pure Muir” Gala, Martinez, CA.